This item is also available in 10-copy packs (USD 6.00 per copy), in 50-copy packs (USD 5.40 per copy), in 100-copy packs (USD 4.99 per copy) and in 500-copy packs (USD 3.99 per copy). 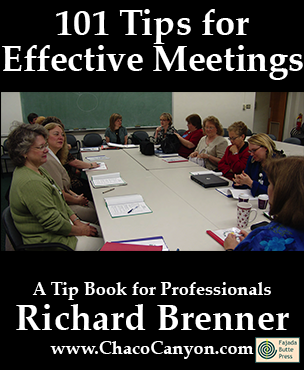 101 Tips for Effective Meetings is in Acrobat format, which gives you several advantages. You can print it, and read it like any book. Or in electronic form, you can use the search capability of Adobe Reader to find passages of special interest to you. If you load it onto your laptop, tablet, or other mobile device, you can read it anywhere — and it's weightless, too. 18 pages.